Why take the trouble to edit your videos on music tunes? Editing your videos "on the beat" will make your clips watchable and memorable. Imagine how would music videos be without the synchronization between the scenes and the tune... Pretty dull I would say. Dynamic videos work great as teasers, trailers for almost any type of events, competitions, tours etc. Rocking music, like the one in my video, work well for action clips: motor sports, mountain biking, free-ride skiing, climbing. I knew from the first few seconds that I wanted to watch the Honda teaser to the end. Having video scenes rolling out on the melody will simply keep your viewers watching by catching their attention in the very first few seconds. 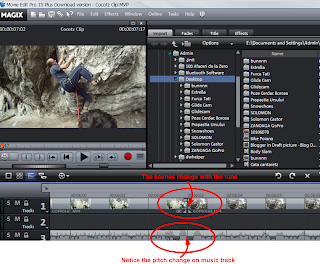 How To Edit Videos "On The Beat"
Firstly, you must import your music track within the video editor. You may not have any idea about the outcome but listening to the music and viewing some footage that you shot may bring up good ideas. If you need or want to use more songs then choose each song according to scenes you want to render. For slow motion scenes use soft music, for dynamic and aggressive action use engaging up beats. You wanna have your viewers pumped! Zoom in on the tracks. Video editors allow you to "zoom" on scenes - basically allow to expand the segment that represents a scene as to view it in smaller time increments (fractions of a second). This enables you to cut your footage right where you want it - you can analyze it frame by frame and find the spot where you need to cut or trim the scene. For example if you have a mountain bike rider flying through air and want to cut the clip just when the biker reaches the ground then you zoom in on the imported clip and drag the cursor at that particular point. Only the zoom mode can show you the exact time at which a certain event takes place in the video. Editing at such detail gives you full control - fine tuning - over the video. Look for pitch changes in the music track. Perhaps you've noticed by now that most video editors show you the pitch graph on the music/sound track. This graph shows you both when the music grows loud/silent and when the pitch of the tune goes high/low. 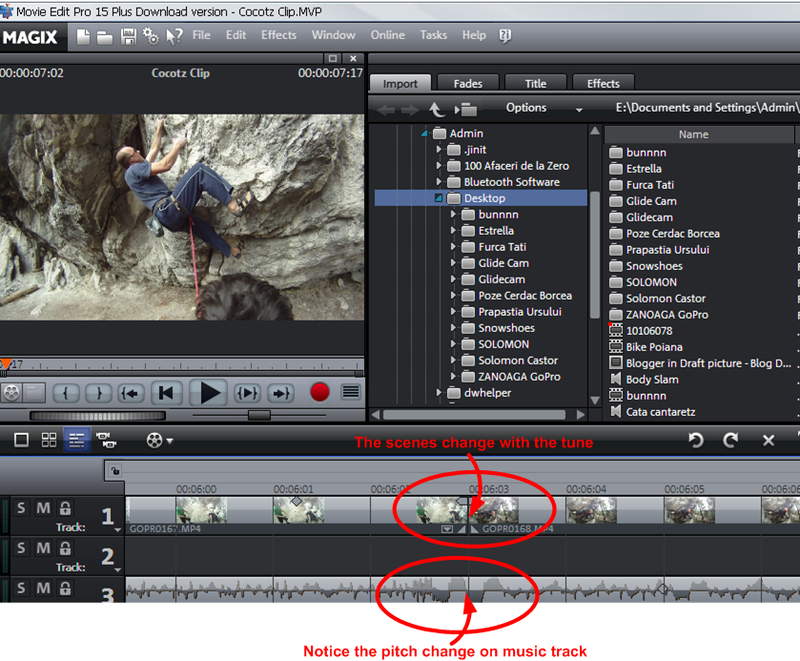 Seeing where the pitch of the sound track changes is key for editing videos on music beats. Scroll the track, find the tune changes and those will be the points where you'll have consecutive scenes - see picture below. Now you don't have to add a new scene with every beat change but where the song has good rhythm it would be nice to have some scenes rolling accordingly. The beat changes can be identified in the graph as visible high and low spikes neighbored by smaller, insignificant spikes. Use dynamic scenes if your video shows action. For instance, the climbers in my clip are moving, leaping, swinging, jumping, falling. All this adds up to the urgency of the video. If you have rather static scenes you can also edit on the beat - just be aware of what it is that you want to convey with your video. Use short scenes. This time we're talking less than a second scenes. Short scenes will enable you to do two things: keep your movie short (internet surfers have a short attention span) and cover all your footage (a few short scenes from each shooting session will tell the whole story, showing images that were taken in a long time span - a few hours or a few days). Have shots from various angles mixed in the video. A sequence of various angle shots will keep your audience curious to see more whereas shots taken from the same perspective will bore the viewers. Keep it interesting. Great climbing video. Looks like a blast and I love the music accompaniment. Wow. GREAT blog. I am trying to edit my first GoPro kayak trip, and have bookmarked your site.